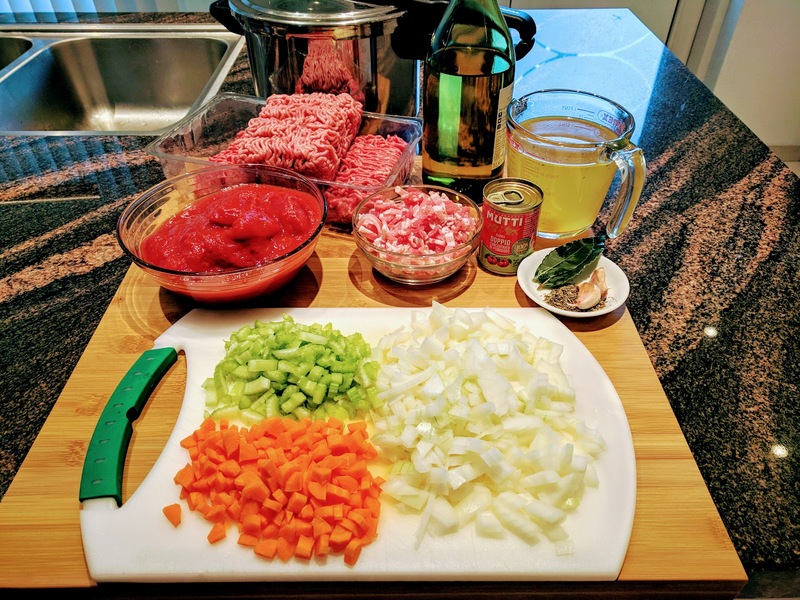 Semantics aside, we all love a rich, hearty Bolognese sauce. 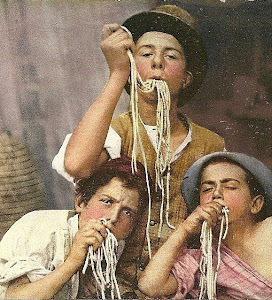 And if you want to serve it with spaghetti, who cares? Kids love it anyway. But we also know that the secret to a good Bolognese sauce is simmering it for 2 hours or even more. That's all good on a Sunday when you have time, but who has time for that during the week? No panic: here is our quick and easy Ragù Bolognese from the pressure cooker to the rescue! Start by frying the pancetta in your pressure cooker with two tablespoons of oil. 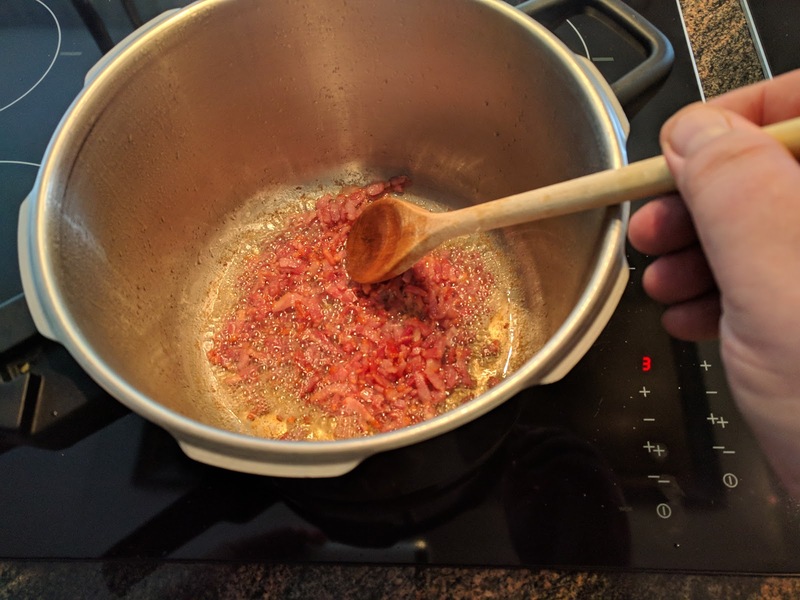 If you cannot get pancetta, use smoked lean bacon. 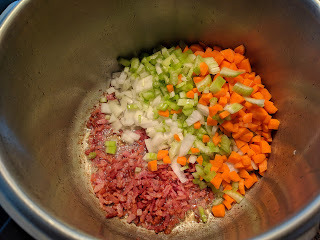 When the pancetta is nice and crisp, add the vegetables and a teaspoon of salt and pepper. Reduce the heat to medium. Sweat until the onions become translucent. Add the finely diced garlic and dried herbs. You can use fresh if you have it. Fry for 1 minute until the garlic becomes fragrant. Make a small space in the middle of the pan and add the tomato puree. Fry it for 1 minute to reduce the tartness. 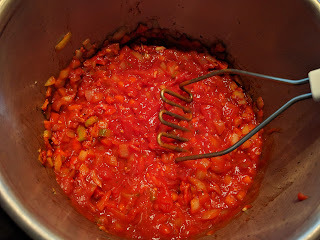 Add the peeled tomatoes and mash them with a potato masher. Rinse both cans with half a can of water and add. Add the bay leaves. 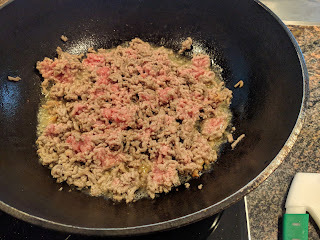 In a separate pan, fry the beef and pork mince in small batches over high heat. The reason to do this separate is the liquid coming from the meat. This way it can evaporate quickly. In your pressure cooker, it would turn into a big slushy pulp that will not fry but cook. And nobody likes Bolognese soup with cooked meats. We need some Maillard reaction going here. 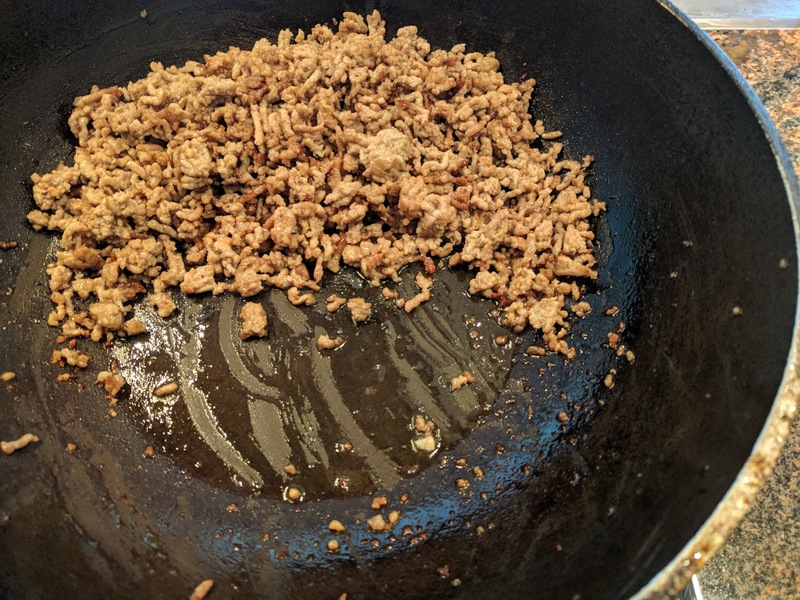 Fry until the meat is nicely caramelized and all liquid has evaporated. We'll deal with the fat later. Add the meat to the pressure cooker. 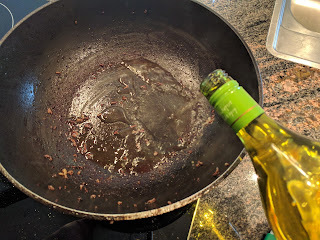 Deglaze the pan with 125 ml white wine. Cook over high heat until the alcohol has completely evaporated. Use a wooden spoon or spatula to scrape all the delicious bits from the bottom of the pan. Add to the cooker. Stir and slowly bring the sauce to a gentle boil. Do not add the lid to the cooker and go to high temperature because this might burn your sauce to the bottom of the pan. Don't add any thickening agents as this will also increase the risk of burning. Once the sauce is gently cooking, add the lid and let the pressure build up to full capacity (12-15Psi - check your pressure cooker manual). Cook for 30 minutes and let the cooker depressurize. 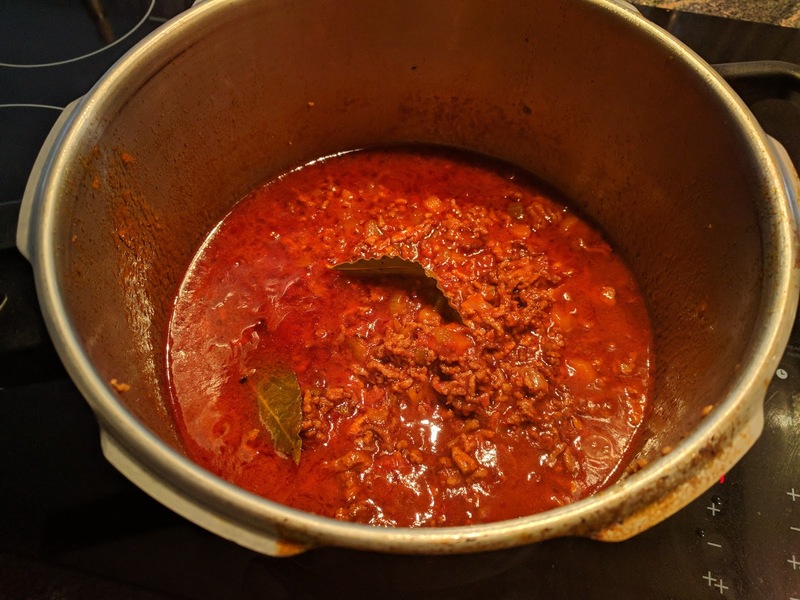 Remove the bay leaves and cook until you get the desired thickness. Depending on your cooker you might even need to add some additional stock or water. Remove any fat floating on top. Move the sauce to smaller containers and let cool to room temperature. 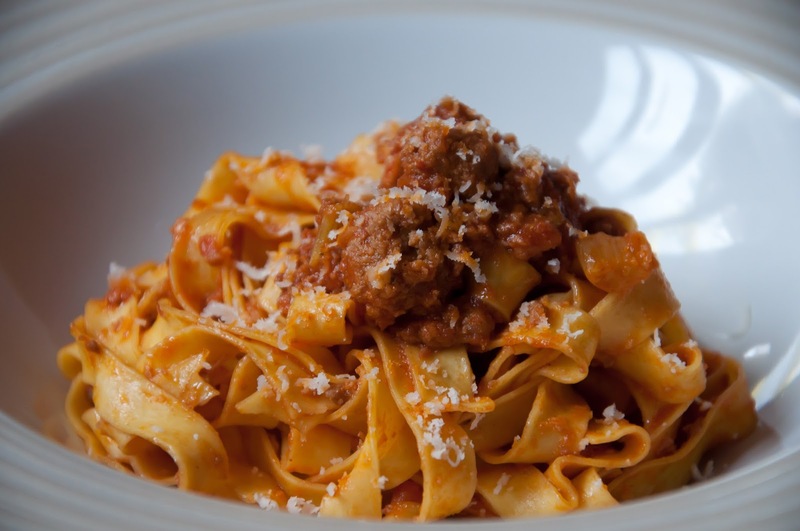 This Ragù Bolognese will keep in your fridge for several days and half a year in your freezer. is much preferred to this quick and easy approach. But for a stew that is ready in less than an hour, it's pretty amazing. For how to cook and sauce pasta properly, read here.